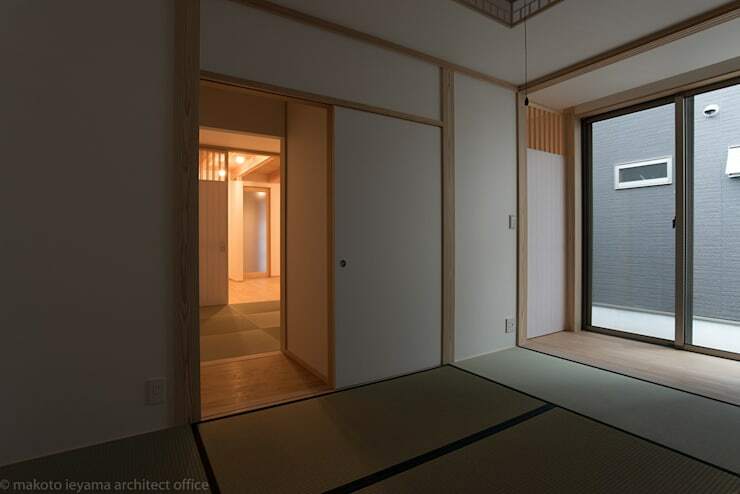 Japanese architecture is known for its quiet simplicity. These are homes with lots of natural warmth and a calm, contemplative ambience. In that regard, the simple grey box home we will visit today fits neatly into this category. 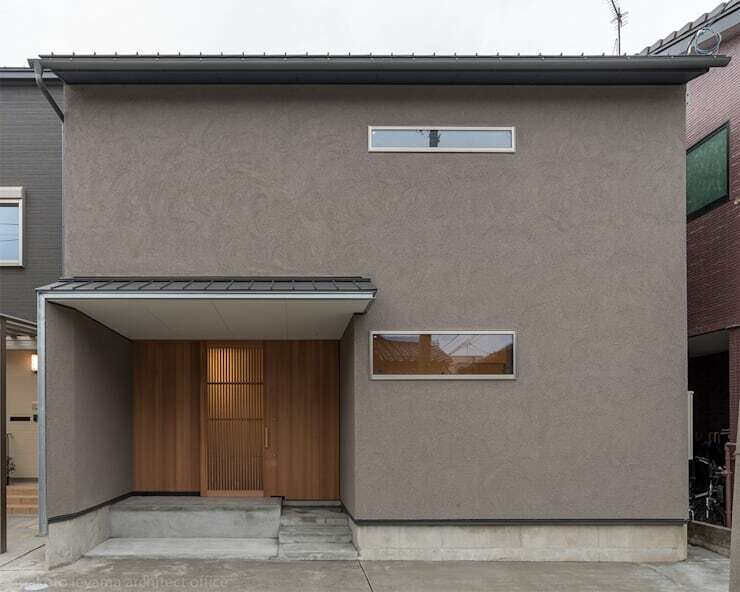 Indeed, it's located in a protected area of Higashiyama Kanazawa City, where there are strict regulations on the colours of the exterior walls and some features such as the galvanised steel roof. The architects Makoto Ieyama Architecture Office have worked within these restraints, but they also approached their design with a spirit of innovation. So if you are interested in how to separate living spaces or explore new variations on old themes, you might just fall in love with this interior. Let's explore more in pictures! 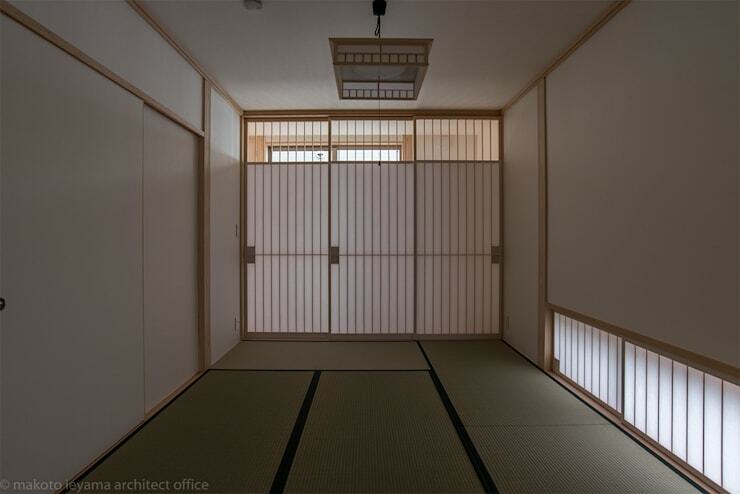 The entrance, or genkan as it is called in Japanese, is composed of a sliding wooden lattice door. 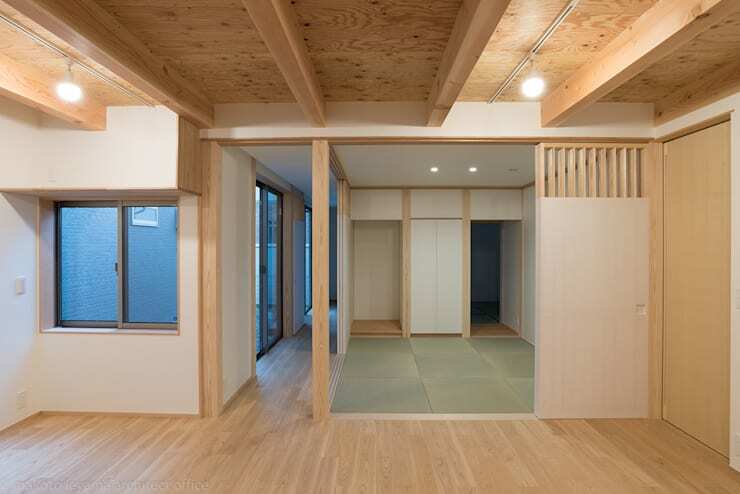 This gives the home an earthy, modest feel that is fairly common to see in modern Japanese homes. 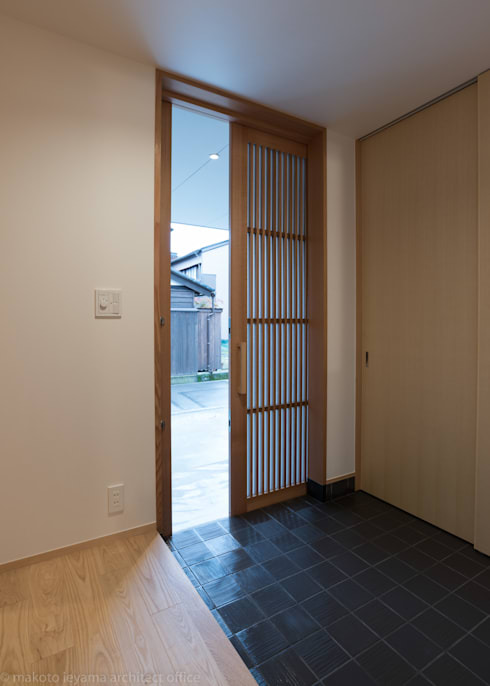 The black stone floor tiles, wooden built-in cabinets and platform-style entrance are other typically Japanese elements. 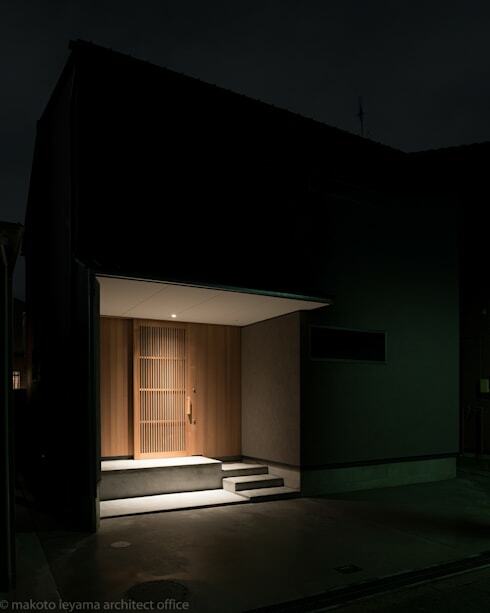 This kind of entrance is very important in Japanese homes. It is designed to emphasise and draw attention to the important barrier between the private and public sphere. The facade has a distinctly Japanese feel due to the restricted colour palette, wide entrance area and unadorned design. It may be just a simple grey box-like home, but it's also one with a certain sense of stateliness. The wide entrance area creates a good contrast against the grey Joripatto walls and small windows. It also acts as a fire-wall. Note how the windows have been designed to let in light without sacrificing privacy. The home has flexible living areas that can be used for a multitude of functions. It also has a private western style sleeping area at the back. The main part of the interior is arranged as one open-plan living area separated by a series of sliding doors. 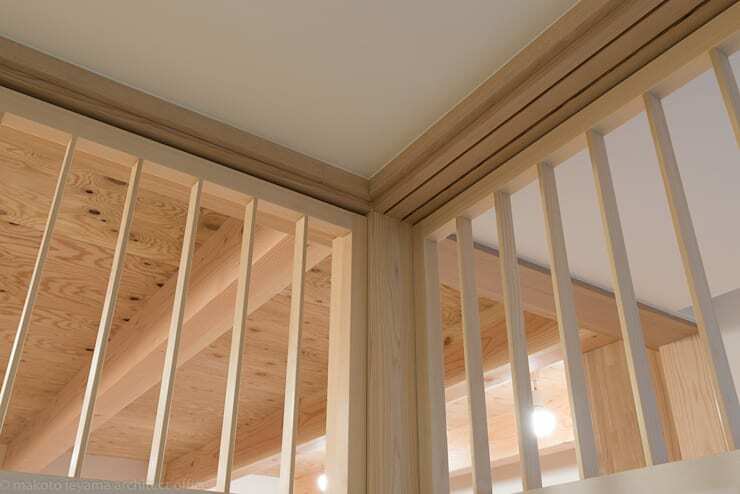 The material is primarily wood and it has been used in a variety of forms from ash wood and red cedar that quietly mismatch. 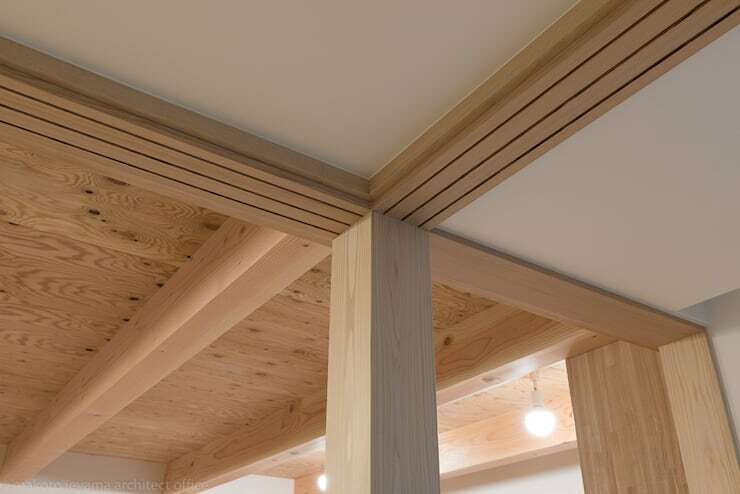 The architects have highlighted this gentle dissonance by leaving the support beams exposed and butting a variety of wood types up against each other. This is a deliberate choice and one that is often used in this kind of home to express the importance of authenticity and imperfection in the design. 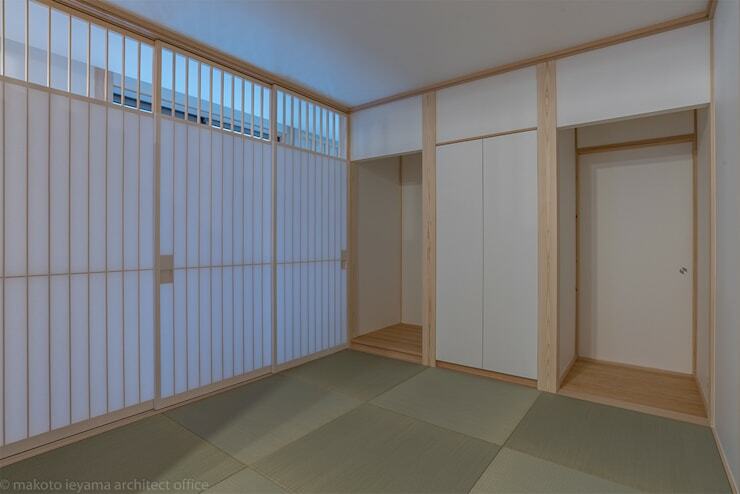 The tatami room has built-in cupboards and a slightly modern interpretation of the traditional shoji-style sliding walls. The wooden panels are covered in traditional rice paper that allows light to penetrate the interior. For a modern take, the designers have left the top portion uncovered. This serves to maintain that sense of visual flow between the two spaces and perhaps reveals the influence of a more contemporary open-plan layout. The window on the right has been designed to avoid a clear line of sight into the interior. It also minimises unwanted heat from the evening sun on this side of the home. Finally, note the quiet contemplative feel of this room. The home is sandwiched between two other dwellings, so the architects have created internal courtyards and inner gardens to create a connection with the outdoors. The internal spaces receive natural light and there are no issues with privacy. For more home inspiration have a look at 13 houses with gorgeous front entry paths. Which of the features we have explored today appeals to you?